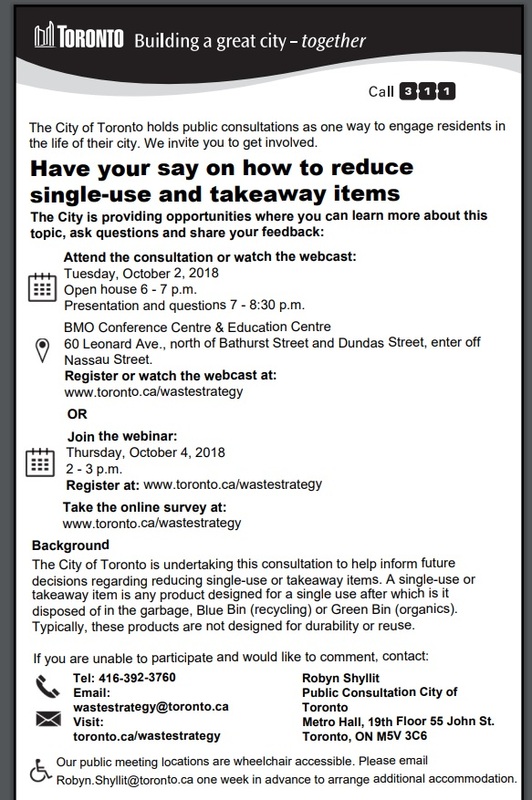 The City of Toronto is undertaking consultation to help inform future decisions regarding reducing single-use and takeaway items. You are invited to learn more about this topic, ask questions and share feedback at in-person event, via live-webcast, webinar, or through an online survey. Please circulate and share this information with your networks. RSVP to receive a link to this event. Comments will be accepted until October 28, 2018. The same information will be presented on both dates. Public meeting locations are wheelchair accessible. Please email Robyn.Shyllit@toronto.ca one week in advance to arrange additional accommodation. Invitations to stakeholder specific meetings will be sent in subsequent communications. Have your say! Take the City of Toronto Parkland Survey. The City of Toronto has a 20-year Parkland Strategy that will be used to help guide the long-term planning for new parks and expanding or improving access to existing parks. This Parkland Strategy will be used to prioritize initiatives and guide decision-making regarding parks and green-space. Residents are invited complete a survey to share their ideas about the City’s parkland priorities for the future. Click here to take the survey. The survey has been extended and … Read moreHave your say! Take the City of Toronto Parkland Survey.